After months of waiting, I was so excited when five of our fabulous milk churns finally featured on BBC2’s ‘The Big Allotment Challenge’ last week. Famous! 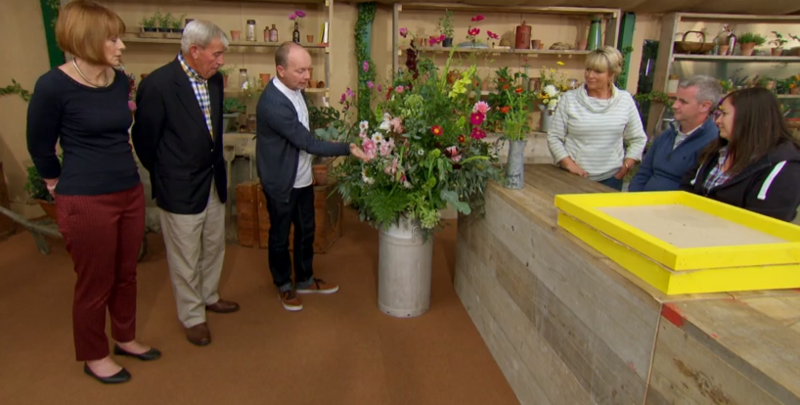 As part of the semi-final, each pair of contestants had to create a pedestal to sit on the milk churns that included chrysanthemums and other flowers from the contestant’s allotments. They did a great job, with the winners Rupert and Dimi producing a beautiful design. Lots of brides hire our milk churns for a pedestal arrangement, to go either side of the entrance to their church or to decorate the inside of their venue. They always look spectacular and are a really stylish way of making a big impact. This one below was created by the very talented Kate Howard, owner of HedgeRose Florist in Marlborough www.hedgeroseflorist.co.uk. We have more TV appearances coming up later this year, including a magic show and a period drama. I’ll keep you posted!